Buttoning shaped or bent buttons can be done at 60 per minute on the rotary capper AVM 738 or 120 buttons per minute of the linear AVR. 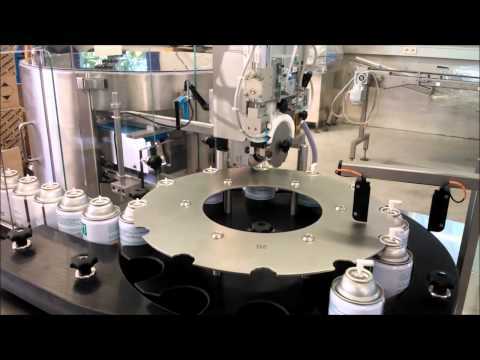 Both machines have stations free to do further tasks such as capping, labelling, check weighing and much more. For speeds of up to 60 buttons per minute the AVM buttoner is simple but robust. The buttoning machine can also be fitted with a second buttoning station to either toggle between buttons or a capping station to act as a Buttoner/Capper. When 60 per minute is not fast enough the AVR comes into its own. The AVR is a Sleek linear buttoning machine with easy ergonomics and partially automamed chang-eovers. Read more on our capping machinery section. AVM738 Buttoner for L-shaped buttons has been delivered to Stoke-on-Trent to an Aerosol factory.